The Wye Valley Arts Centre01594 530214work Art GalleryThe Wye Valley Arts Centre in the heart of the picturesque village of Llandogo is an inspiring environment with excellent studio facilities and an ideal place for students to enjoy a wide range of courses which includes Painting, Drawing, Sculpture, Silver Jewellery and various crafts such as Making Mosaics. Beginners and improvers are very welcome on all the courses as all will enjoy the individual attention which the tutors can give to small groups of students. There are 1, 2 and 4 day courses and weekly classes. Please ask for further details. We hope you will find an opportunity to come to The Wye Valley Arts Centre to enjoy our beautiful inspirational surroundings – the perfect creative environment. 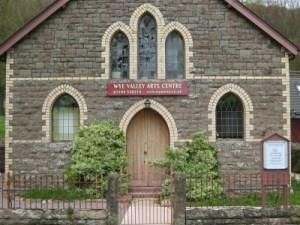 The Wye Valley Arts Centre in the heart of the picturesque village of Llandogo is an inspiring environment with excellent studio facilities and an ideal place for students to enjoy a wide range of courses which includes Painting, Drawing, Sculpture, Silver Jewellery and various crafts such as Making Mosaics.